You were held by this love. Yeah, it rocked. And yeah, there were several times (like when Bono cried out, “uno, dos, tres, catorce”) that I thought 60,000 people were going to jump out of their skin in unison. But I also think there is something deeper going on. Something pretty significant. to deal with the human carnage that is inherent in this kind of bad eschatology.This weekend I had a conversation with a young woman who was convinced by her Pentecostal church that it was a waste of time for her to attend college because Jesus was coming back so soon. Eight years later she is understandably very hurt with the path that she chose after trusting her spiritual leaders. 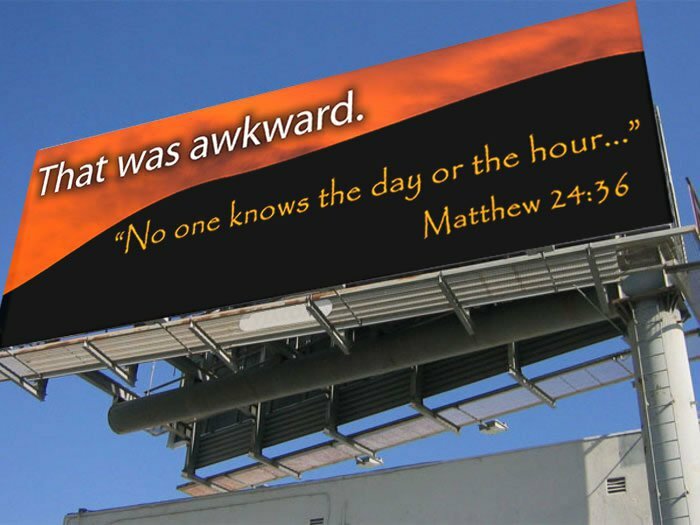 I also don’t think the whole episode is very funny to those who gave their life savings to Camping’s organization to put up billboards. For those of us who are insiders – can we agree to corporately repent of all the times that we distracted people from REAL issues with speculation and trivia?Can we repent of ways that we have been so heavenly minded that we are of no earthly good?